Time has flown by so fast lately that I completely forgot to post my October wish list! Better late than never though right? 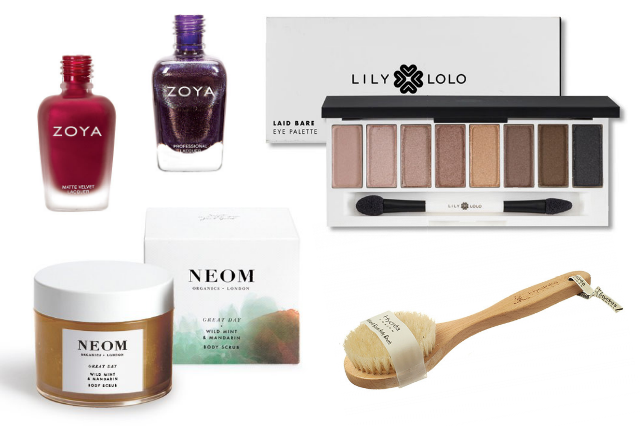 As we're well into the autumn season here in the UK, this month's list has a slight autumnal theme with all the latest products I've been lusting over! I've put myself on a little nail polish spending ban recently as I have far too many, but I just can't help but want more! From swatches I've seen, I absolutely love the look of Zoya's Matte Velvet Nail Polish in the shade Posh - a medium wine red with a unique matte finish. I also have my eye on the entire Ignite collection, but the one that stands out most to me is this metallic shimmery eggplant/aubergine shade called Sansa - where's the heart eyes emoji when you need it?! When Lily Lolo launched this limited edition eyeshadow palette it went straight on my wish list! I've never actually owned a whole palette before (madness I know!) so I don't think it will be long until I cave in and buy it! It contains 8 wearable neutral shades which are perfect for both daytime and evening looks. I think I might have had a body brush on one of my blog wish lists before, but I've been meaning to get one for ages now and keep forgetting! Not the most glamorous of beauty products. but they're supposed to be great for exfoliating, softening, detoxifying (improving lymph flow) and stimulating circulation. I'm definitely intrigued to try it out! I'm in desparate need of a new body scrub and, although I'll be picking up something more budget friendly for the time being, this NEOM scrub is at the top of my lust list! It's 100% natural, made with 97% organic ingredients and the wild mint and mandarin sounds like the most amazing refreshing and uplifting fragrance. What's on your autumn wish list? Have you tried any of these products before? I spot some lovely finds! Those Zoya polishes are absolutely gorgeous and I'm loving that body brush. That Lily Lolo palette is definitely on my wishlist too. The colors are all so wearable and neutral. Zoya's Matte Velvet Nail Polish in Posh also looks lovely. The eyeshadow palette looks so pretty! I bought the make-up Lily Lolo palette 2 weeks ago and it's brilliant. Would definitely recommend it to anyone! It's the natural-hued palette I've been waiting for them to come out with for ages. I've only used their loose mineral eye shadows up to buying it and they're every bit as good as them. Great quality, very comfortable on my sensitive eyes, too.